Geeks. Fantasy. Sci-fi. Role-playing games. Tens of millions of people across the World now turn away from the 'real' world to inhabit others. Comic book conventions, Renaissance fairs, live-action role-playing games, and even old-school, low-tech games such as Dungeons & Dragons. Movie fan-freaks design costumes and collect "Lord of the Rings" action figures. The online game World of Warcraft has lured eleven million users worldwide. Who are these game-players and fantasy fans? What explains the irresistible appeal of these escapist adventures? And what could one man find if he embarked on a quest through fantasy world after fantasy world? 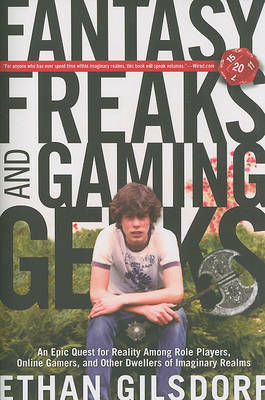 In an entertaining blend of travelogues, pop culture analysis and memoir, 40-year-old former role-player (teenage D&D obsession) Ethan Gilsdorf crisscrosses the U.S., the world, and other worlds, from Boston to California, Atlanta to France, and Planet Earth to the realm of Aggramar. He asks gaming and fantasy geeks how they find balance between their escapist urges and the kingdom of adulthood. He questions Tolkien scholars and medievalists. He speaks to grown men who build hobbit holes and learn to speak Quenya and Sindarin, and to grown women who assume digital personae to explore World of Warcraft (WOW) and Second Life. 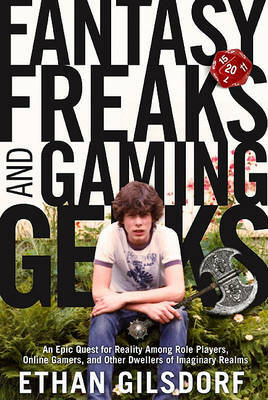 Buy Fantasy Freaks and Gaming Geeks by Ethan Gilsdorf from Australia's Online Independent Bookstore, Boomerang Books.